La Victoria Red Taco Sauce Mild - 15 oz. La Victoria has built a legacy of bringing you delicious, authentic-tasting Mexican food products. Say "Adios" to ketchup! 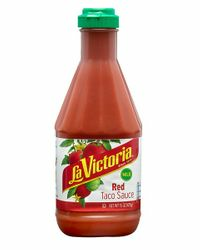 La Victoria Red Taco Sauce is excellent as a spicy ketchup over all your favorite dishes, including eggs, vegetables, hamburgers and hot dogs. Use it as a base for Pizza its delicious. Salsa roja para tacos mediana con jitomates molidos, chiles, cebolla, ajo y cilantro. Salsa taquera La Victoria. Been using this sauce in my tacos for years. I wouldn't make tacos without it. ProsImparts the perfect flavoring to my tacos without adding an over powering heat. This taco sauce has been a staple in our house for years now. You can tell that high quality tomatoes are used. This is not one of those vinegar sauces with lower quality ingredients. This is a far superior product compared to other taco sauces on the market. The cost may be slightly higher than others, but it is well worth it! THIS IS THE BEST TACO SAUCE AROUND THE PLANET. THE FLAVOR CAN'T BE BEAT. I ORDERED EXTRA BOTTLES FOR MY STOCK PILE. YOU WILL LOVE THIS FLAVOR MY FRIENDS. LaVictoria red taco sauce has been our favorite for over 30 years. Always consistent in its quality and taste. ConsHard to find in South Carolina. Price online is quite high vs. the price I paid for the same 15 oz. bottle while visiting family in California (paid $2.90). When shipping is added it becomes a luxury purchase. Loyal customers do not get coupons or free shipping. exactly wha tI was loking for. Love this Taco Sauce and Love the customer service at MexGrocer. I periodically order several large bottles of La Victoria Red Taco Sauce from MexGrocer.com because I can't find it in my area. I've only had one problem where Green Taco Sauce was shipped instead of Red. I contacted MexGrocer customer service and was helped by a delightful young lady named Amanda. She corresponded with me until all my questions were answered and she had the correct product re-shipped to me immediately. I was very impressed and will continue ordering from MexGrocer because of Amanda's dedication to keeping satisfied customers and her company's policy that allowed her to help me so quickly and completely. My thanks to you, Amanda, and to MexGrocer.com! ProsI love the taste of this red taco sauce and could almost drink it right out of the bottle as if it was a soda! They have quit selling it in our town too., Hinesville,GA. I have used this product for years but since moving from California to Tennessee, I can only purchase it on line. Will continue to do so until it comes into grocery stores. ProsI like it a lot. ConsYou need to package in a 32 or even 64 oz. container, when I have family over for taco's we go through 2 or 3 15 oz bottles. LaVictoria is the best taco sauce I've ever tasted. Can't find it any more in St. Louis stores, so I'll keep ordering on line. I just love this sauce, it tastes wonderful and the 15 oz bottle is great. I can't find this product let alone in the larger size in my area any longer. As I am unable to find this product locally anymore I was thrilled to find your site and to be able to get it in a 15oz container is great. this is one of the best sauces I have had. This sauce stopped being sold in NE Florida. Was so happy I found it online, I was down to my last bottle. Best taco sauce I've ever tasted. This is my wife's favorite sauce. We buy it here because we can not get it in local stores in Florida like we could when we lived in Wyoming. I absolutly love this stuff, and have gotten my kids hooked. I'm from Cali and live in NH now and was able to buy it in a few different grocery stores but now no one is carrying it, just hot. What gives? This stuff is awesome, it also very hard to find in the midwest! This stuff is as close as you can get to the Del Taco chains hotsause. Its the best! !